If you've ever visited the Taj Mahal in India, stood on your head, and thought its unique design and tall spires would make for a lovely table if upside-down, you're not alone. The designers at Studio Job thought the same thing, and went ahead and built one. The studio had to make a few tweaks to the Taj Mahal's design so that it would work as a table when inverted—namely lengthening the corner spires so that they touched the ground at the same level as the center dome. And they painted it black. But otherwise, it takes advantage of the exact same architectural principles as the real Taj Mahal for structural strength, including the use of the dome shape which is incredibly effective at evenly spreading weight across its entire surface. 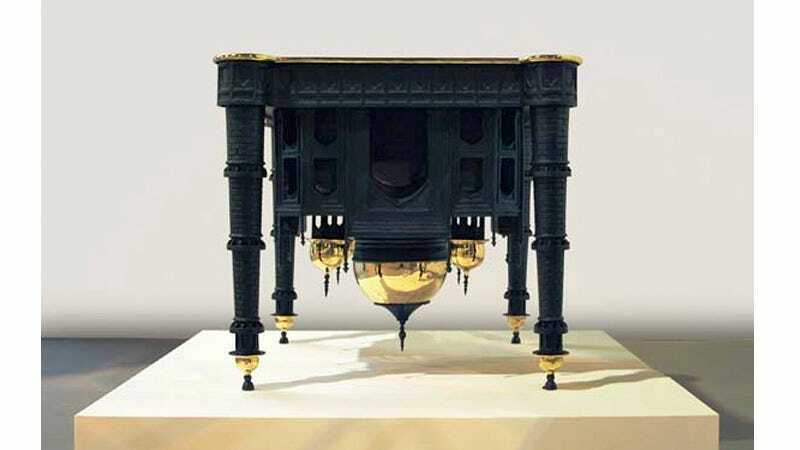 And while the table is as beautiful as the grandiose structure that inspired it, we can't help but wonder where you're supposed to put your legs if sitting at it.